They’re coming. If you live on the Eastern seaboard of North America, prepare this summer for a large-scale invasion of a species of cicada (“cicada” being the Latin for “tree cricket”) that hasn’t happened in 17 years. You will probably hear them before you see them, as a male swarm of these insects can produce noise at over 100 dB. The cicadas will arrive this summer, but they’re not coming from the skies. The primitive-looking insect will start popping up from the ground in massive numbers and begin scaling the trees (or anything standing up) after living underground for the past 17 years. In some states, creeping waves of the locust-like grubs are already emerging in ever-increasing numbers, darkening the trees around as they haul themselves up with two large claws. But their journey has only begun. After halting at a certain spot, the creature molts (called ecdysis): It’s back splits open to reveal the next stage of its transformation (called instar). A soft, pale winged creature emerges from the husk of the nymph. It’s body darkens as it hardens until it resembles the familiar broad-backed cicada, complete with menacing red eyes and handsome orange-veined wings cloaking a marvelously steampunk build. The deafening sound you will begin to hear as you pass beneath the trees is the males calling out for females amidst thousands of other males and even other species of cicada on the same tree. Two weeks of single-minded passion ensue, after which the pregnant females complete their reproductive destiny by scarring the tree branches and inserting eggs into the opening she creates. When the eggs hatch, the nymphs fall to the ground and immediately start digging into the earth and begin feeding on tree root juices, gradually developing and then emerging years later, as the cycle begins anew. After completing the mating cycle, the shivering racket in the trees begins to fade, and the cicadas drop dead in massive piles that must be raked and shoveled. As far as natural phenomenon go, the event this year promises to be particularly awesome with Brood II expected to number in the billions. You might be wondering how the cicadas all know when to emerge after living entombed for so long deep in the dark ground, particularly as the environment they live in more or less has fairly static conditions (typically 1-8 ft. deep). It was once thought that the secret lay in an internal body clock where they are keeping track of the passage of night and day and the seasons without direct environmental cues. This periodicity is present in virtually all of Earth’s living creatures, a hidden biological mechanism in tune with the cycles of nature. Seems like a pretty solid theory. However, this has recently been debunked, at least to some extent, thanks to an experiment done at University of California. The experiment was designed to test if the cicadas are picking up on cues from the trees themselves, which they are feeding off of. In fact, this appears to be the case. The experiment tested this by taking peach trees and manipulating them to get them to blossom twice a year, instead of just once. The researchers then took cicadas that were 15 years old and placed them in the soil of the peach trees that would blossom twice in one year. The results was that after the second blossom of the peach trees, the 17 year cicadas emerged after just 16 years. So it appears the cicadas seem to keep track of how many springs there have been using the tree sap in the roots, which during spring will have an upswing in sugars and the like. When the cicada detects the 17th upswing, they emerge. So there is some mechanism in their brain capable of counting, just not free from environmental cues. So what possible use is this overabundance of this bug? Besides aerating the soil with their burrowing and fertilizing it with their cast-off husks and dead bodies, cicadas also feed the local squirrels, mice, birds, moles, raccoons, etc., thus contributing to those populations, and the overall ecological nutrient cycle. If you’re wondering if the cicadas which carpet our neighborhoods have any other use, it turns out that Native Americans also historically enjoyed eating them when they’re fresh, among other cultures. Cicadas are high in protein and low in fat and carbohydrates, and taste somewhat like asparagus, but without making your pee smell. The adult can be fried or, better yet, the newly emerged ones, called tenerals, can be grilled directly. Since ancient times, cicadas have also been a regular commodity in traditional Chinese medicine, especially the cast-off shell (called ChanTui), used to combat a wide range of maladies including fever and rash, and is even used as a treatment for cataracts. Although cicadas are mostly harmless to humans, they are quite unstoppable, so there is nothing to be done except to weather the noisy swarm-storm that is coming. Male cicadas make their very noisy song by rapidly contracting the muscles of two ridged membranes called tymbals. While Cicadas won’t bite or sting people for defense purposes, they do occasionally mistake human limbs for trees, and may then try to pierce your skin with their proboscis, which can be extremely painful. There are thousands of types of cicada, not all of which go on a 17 year cycle. Some are on 13 year cycles and others even emerge every year. The most infamous of the 17-yr cicadas is the Magicacicada. Broods from different regions actually pop up in different years, though, as each brood keeps their own synchronized cycle. Male cicadas have largely hollow, abdomens, perhaps serving to amplify their mating calls. Fortunately, cicadas never sing at night. 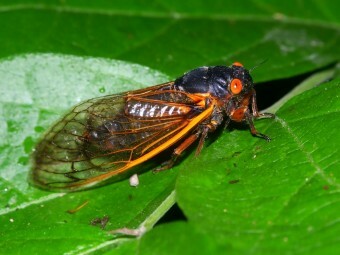 Cicadas hear with organs located under their abdomen. Cicadas have five eyes, two compound eyes and 3 simpler ones in between forming a triangle. Cicada wings shield its body effectively from UV radiation. ‘Shedding the golden cicada skin’ (金蝉脱壳) is a Chinese military term that refers to the use of decoys to escape enemies using diversion tactics. Cicadas, archaically referred to as locusts, are actually related to leafhoppers and spittle bugs. Last year (2014) I witnessed an extroadinary swarm in Cairo. Egypt, which literally turned the afternoon sky black. Afterwards, I had to clear dozens off my balcony. My kids kept a big 3.5 incher in a jar for a while. My 80 year old mother-in-law said she’d never heard of or seen such a thing in her life. One of my dogs used to run around catch them and eat them.